So you must somehow distinguish between normal users, groups, the everyone group and the anonymous group. If you read the security descriptor as XML stream via the http://schemas.microsoft.com/exchange/security/descriptor property, you get this information for the existing entries. But if you add another principal to the list, you must insert the entry at the correct position, depending of the type of the account being added. In this article, I'll present a .NET implementation for the latter approach. The following code is taken from my InfiniTec.Security library, and implements a class, which takes a IdentityReference instance in its constructor. The account type is then exposed via the AccountType property. Note that you can also specify a remote computer, on which the translation should be performed. Since no alternative credentials can be specified, you must impersonate another user account if needed. 8 /// and vice versa, optionally using a remote computer for the translation process. 18 /// Returns the <see cref="SecurityIdentifier"/> of this instance. 29 /// Returns the <see cref="NTAccount"/> of this instance. 61 /// Creates a new instance of this class. 132 /// Compares this identity with the specified othe identity. The interesting stuff happens in the TranslateFromSecurityDescriptor and the TranslateFromNTAccount method. They prepare some buffers and call the LookupAccountSid and LookupAccountName function. On return of either these functions, the account type is stored in the _AccountType field. The EntryId (stored in the property http://schemas.microsoft.com/mapi/proptag/xfff0102) is a binary structure uniquely identifying elements in the Exchange store. It basically consists of two identifiers (three for folders): The MAPI store where the element is located (either a mailbox or a public folder tree), the folder identifier and the message identifier. Unfortunately, the store identifier cannot be mapped to a mailbox or public folder tree, so you must know in which store the element is located. But this should not be an issue in most cases. The folder and item identifiers consists of a global unique identifier and a sequential number. The combined value of these identifiers can be used to construct a permanent url (found in the property http://schemas.microsoft.com/exchange/permanenturl). This url never changes unless the item is moved to another folder. 17 // Now comes the store guid. As you can see, there is some bit-flipping going on during the process. This is because the guids in the EntryId are stored differently than they are used in the permanent url. At last, the folder id, folder sequence number, element id and element sequence number are concatenated and appended to the base url. The result is a permanent url which can be used to access the element. To use this method, just wrap the binary value of the EntryId in a BinaryReader class and pass that instance to the DecodeEntryId method. The method above will not work for all EntryIds. Depending on how the EntryId was obtained, it may have a different structure. This is because EntryIds can either be short-term or long-term identifiers and are usually just passed to the IMsgStore::OpenEntry method within a MAPI session. But an EntryId obtained through the http://schemas.microsoft.com/mapi/proptag/xfff0102 property should work. If you obtained the EntryId via a WebDAV PROPFIND command, you must decode the BASE64 string to a binary array using the Convert.FromBase64String() method. 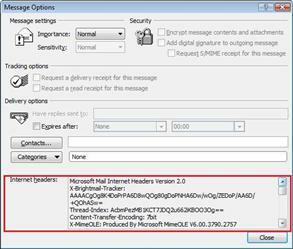 Ever wanted to read the internet message header of an email via WebDAV? This property is available via the property http://schemas.microsoft.com/mapi/proptag/x7d001f. If you have tried to access an Exchange 2007 mailbox or public folder via WebDAV with Formbased Authentication enabled, you might have found out, that it does not work in the current bet: Although you get the necessary cookies, the next request fails with a 440-Login Timeout. This happens because of the way the Exchange virtual directories are set up - the /Exchange virtual directory runs in another application pool than the /exchweb virtual. This results in different encryption keys being used for the encoding of the cookies. To work around this, ensure that /OWA and the /Exchange and /Public virtual folders are running in the same application domain. However, these changes are unsupported and may break uninstallation of Exchange 2007. This issue has been fixed in post-beta 2 releases. Btw, the Exchange version I have tested this on is 8.0.605.16. The Spam Confidence level is stored by the Intelligent Message filter on every message. It is stored in a MAPI property called PR_SCL. The value of this property is 0x40760003. Via WebDAV, this property is available via the property http://schemas.microsoft.com/mapi/proptag/x40760003. On MSDN , there is an article describing describes the necessary steps to create an event sink with managed code (Building Managed Event Sink DLLs), and another one (Managing Event Registrations) explains how to register the eventsink on the target server. Unfortunately, that article does not explain how to deploy the event sink into production. The part where the COM+ application is created is simply missing. Additionally, the example misses one attribute that should be added to the assemblyinfo.cs (or assemblyinfo.vb). Be sure to insert the correct name of the COM+ application in line 2. 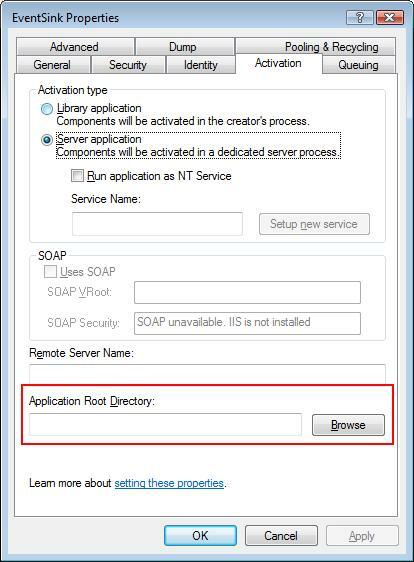 Once you've copied all the assemblies into a folder on the destination server, you can use the Regvcs tool to register the eventsink assembly and create the COM+ application (Note: The above link points to the .NET 2.0 documentation. But the tool is also available for .NET 1.x). Here you should select "This user" and enter a user account which has access to the folder to which the event sink will be bound. 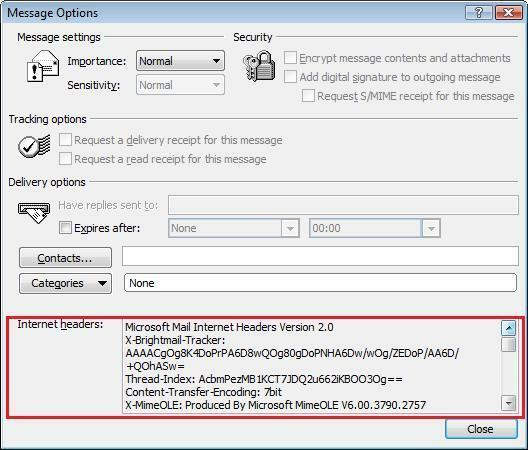 If you are writing a global event sink which is bound to a mailbox store, and want to access items outside of the scope from the thread on which the OnSyncSave method is called, that account must have permissions to access all mailboxes on that store. See How to grant access to all mailboxes on a mailbox store to a special account for more information on how to do this. If you want to use an application settings file, you shoud read this article. 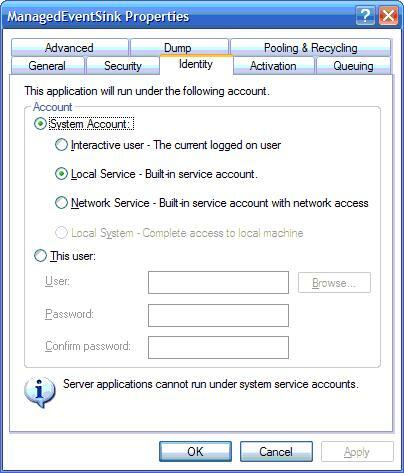 Loading of dependent assemblies - Windows 2000 will look for dependent assemblies of the eventsink in the working directory - which is %SystemRoot%\system32. To get around this issue, install all assemblies in the Global Assembly Cache. Accessing configuration data - On Windows 2003 you can access an application.config by creating a manifest file and setting some COM+ options (See How to use applications settings from an event sink). Unfortunately, the required options are not available on Windows 2000. You'll have to put your configuration settings into the file %SystemRoot%\System32\dllhost.exe.config. The file will most likely not exists, so you'll have to create it.